Our long overdue CCs game finished when Dave blundered in the middlegame - taking a piece, but missing a checkmate threat. Ray played Michael and Drew. Graham B and Pete came in to help with equipment audit. If i have missed anything let me know. The heater in the alleyway has been condemned, so we may need to bring some heaters in from home until we come up with some other solution. Tuesday 5th October: HA1 Vs Loughborough 1, and HA3 Vs Syston3 - both matches at home. Tuesday 12th October: HA1 Vs Melton 1, and HA3 Vs Baunstone 4 - both matches at home. No match for HA2 this week. If you have not yet paid your subs for the coming year, please give £25- to the first committee member that you see. Our league fees for the season are now due and we pay these out of the subscriptions that we collect. The annual subs also include membership of the English Chess Federation. We should have enough people going for at least one and possibly two teams. If we have any extra players, then that is fine as they always make up scratch teams on the night. Quite a few of us are going this weekend. Good luck everyone in the Charity Quickplay and the Atkins. Club night at the Heathcote, and Ross Vs Ricketts in the CCs minor section. LRCA Annual Prizegiving and Charity Quickplay at Spinney Hill. We will be collecting the Division 5 winners trophy, The Wylie Cup, The Birstall Cup and Rob will be collecting The County Championship (Major) trophy. Leicester Chess Congress (The Atkins). 78 confirmed participants, so far (6PM on Sunday with 5 days to go), including, local Grand Master, Mark Hebden who must be the favourite to win the open section. Even if you are not playing, it is worth going just for the bookstall. There were some friendly games too, and no great surprises sprung. Drew & Michael practiced writing their moves down in preparation for the League season kick-off, which is fast approaching. Just to let you know, we managed to win The Birstall Cup last night. I don't have the details but we needed to win 3.5 - 0.5 . We beat Wigston (2) 4 - 0! Dave Bray , Graham Booley , Mike Cowley and myself all winning. On top of The Wylie Cup victory , a great week for The Heathcote Arms Chess Club. On Thursday, Ray drew with Guy Closs in a 78 move marathon. Guy has now finished his games with 4/6. Dennis Wilkins is also on 4/6. If Ray beats Stan, next Tuesday, he will also be on 4/6. In the event of a tie, there will be a rapidplay play off. Andy Carter is currently on 3.5/5 (having on his game against Stan the Man) and if he beats me next Tuesday would win the competition with 4.5/6. There will certainly be a club night on Tuesday. The last round of the County Champs Minor Section (the remaining important games, anyway) is taking place at the Heathcote. If you are free, why not come down and give the home players some support, or play some casual chess? There will be a club night on Tuesday 28th, and I have a graded game against Haka Dave. On Thursday, it is the LRCA annual Prizegiving and Charity Quickplay. The quickplay is a series of 15 minute matches with 4 players in a team - tremendous fun - although, unfortunately i will not be able to be there this year. We need as many club members as possible to come to the Prizegiving so that we can carry all the trophies home. On Friday, Saturday, and Sunday, it is the Leicester Chess Congress (aka The Atkins) - our home tournament in Leicester, where our club will be well represented. Last night we went to Loughborough, in a potential wooden-spoon decider. I enjoy going there - the natives are friendly & the beer is cheap. As Ray parked the car next to an (slightly overgrown) Wendy House, I said to Ray "I wonder what they use that for?" Shortly afterwards, it became clear - that's where Loughborough play some of their chess. On being invited in, Terry Adcock suggested to Colin that he ought not to go to one end of the room, otherwise he might go through the floorboards (to avoid any legal issues he did say the floor was rotten there and I was close by at the time so the comment might also have been aimed at me too). Loughborough's side consisted of two familiar faces: Michael Fraser & Stuart Gordon (who do such sterling service on updating the LRCA website) and two youngsters Masters S. Kohli & A. Trusz, who were playing their first matches for Loughborough. In the first round on Board 3 I lost in very short order indeed (in my defence I started playing at the same move rate, which was fatal.) On Board 2, Colin, having been a couple of pawns up, lost to Stuart in a King & Pawn vs. King endgame. Rob, the new County Champion, won against Michael. On the bottom board, Ray lost (eventually) to his opponent. So at half time we were trailing 3-1. In the second round, I scratched a half with even material by repeated check, having about 3 minutes left to my opponents 20 & Michael got his revenge on Rob. Colin mated Stuart with literally seconds left on his clock, and Ray succumbed a second time to his young opponent. A. Trusz - R. Beach 1-0, 1-0. Final score Loughborough 5.5, Heathcote Arms 2.5. We are now depending on our friends at the Red Admiral to beat Braunstone to ensure that we don't win the wooden spoon. On a happier note it is reported that the first team's result on Tuesday night means that they have won the Wylie Cup. Congratulations to them on that. Good luck to Ray, who is playing Guy Closs in the Minor section of the Counties tonight. If he wins, he will be favourite to win the Section. Colin & I will play our game in that section scheduled for tonight on Tuesday, with only pride and the possibility of the wooden spoon being at stake. Colin has beaten me to a report on this, but I thought I would put in my tuppence worth. Following Rob's win on Tuesday at the Arms against John Daniel, he needed to win, and hope that Colin didn't. Rob won in fairly short order against David Reynolds and joined Dennis Wilkins & I in the bar early - Rob seems a confident player at the moment and I might nip to the bookies and stick a fiver on him for making a splash in the Atkins. As Colin notes in his match against John Daniel he got into an endgame with two Knights against a Knight & Bishop, both players having an equal number of pawns. By this point we've had a drink in the bar and went back to watch the denouement. As Colin very fairly points out it was the pawn issue that did for him. He neglected to mention his very cheeky draw offer at a later stage, which John turned down. After Colin's resignation we retired back to the bar to celebrate/drown our sorrows. Congratulations to Rob on being the Heathcote's first County Champion. Well done also to Colin to hold his own so well in such a highly- rated section of the Championship. The match between the two Grahams (Booley & Sharpe) finished early, but I am unable to confirm the result as my attention was to my right where Colin and Rob were playing rather than my left. Number 4 - "causes more grief"
Number 3 - "a transit from better to worse"
Number 2 - "not a good decision"
and at Number 1 "terrible" (tell it like it is, my Silicon Chess Buddy). The new Number 5 knocked out "what a pity, victory was in sight." The Minor Section of the Championship is now very interesting. Dennis has finished with 4/6, Guy Closs has 3.5/5, Ray & Andy Carter have 2.5/4. So there is still a lot to play for. Congratulations to Rob on winning the Major Section of the CCs. First, his fifth round game from Tuesday against John Daniel with annotation by Rob. Rob - who was slow to start scoring points in the competition- followed this up, on Thursday, by demolishing David Reynolds, in the last round, with the black pieces, in the Kings Indian variation of the Pirc Defence. At this point, i was still playing for a win against John which if it had come off would have forced a play off between myself and Rob. It was not to be, however. I had the white pieces. John had just played 31...g3. 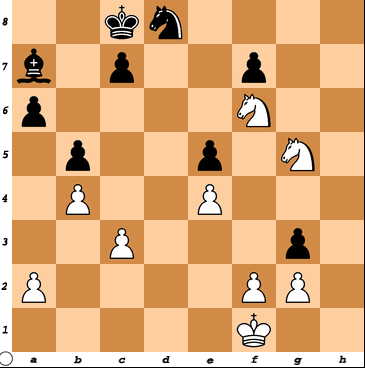 Instead of playing 32 fxg3 - winning a pawn, however, i played 32 f3 putting the pawn on a white square out of reach of John's bishop thinking i would have time to bring my knight to h5 and then take on g3. Instead, John was able to get his bishop to e3, then d2 and things deteriorated for me on the queenside and i did not last much longer. Unfortunately, i did not see any of the other HA players' games. I know that Haka Dave lost, in the Minor, to an in-form Dennis Wilkins. Once i know what the rest of the results were, i will put them in here. HA1 compete at home in the last round of the Wylie and stand an excellent chance of winning the cup. There may be some friendlies, too. HA2 competes away at Loughborough in the last round of the Harrod where we have an excellent chance of winning the wooden spoon. The second to last round of the Minors, at Wigston, in which Ray will be playing with the black pieces against Guy Closs. There will be a lot of interest in this one. Rob won his County Championship match against John Daniel with a very neat finish indeed. Ray, Drew, Michael & I played some friendlies. At the conclusion of the evening we played a pairs game (no conferring) in which "Micdav" beat "Drray" after a titanic struggle. Thanks to Michael for pulling me through. In respect of Colin's earlier post about a programme on the "wireless" for those born after 1960 that is a radio. In addition, after the programme is broadcast it will be available on the BBC World Service Website for a time. I have heard the trailers and it sounds very good. Good luck to HA1 for their Wylie Cup match and the Birstall Cup final, which I understand is next week. Update - Week of 31st August 2010. Just to keep you updated, we [Heathcote Arms 1] play our Birstall cup semi next Tuesday 7th at The heathcote and our last wylie cup match on 14th at the Heathcote, if we win we stand good chance of winning the Wylie cup. On Tuesday 31st, we had a (now usual) decent turnout for Club Night. We had some practice using clocks and notation, at the same time, for our newer members. The slowing down and making note of the moves seemed to work well as, first of all, Michael gave Dave R a serious scare, and Drew pulled off a fine victory against Ray. Only a month to go until the start of the season. There are still several people owing subs - please pass these on to any of the committee members as the request to pay our league fees is imminent. On Tuesday, 7th September, there will be the Braunstone Rapidplay. At the Heathcote there will be HA1's Birstall Cup match, and Rob also faces John Daniel in the Major section of the County Champs at our place. A win against John, and then David Reynolds in the final round should see Rob clinch the title. A loss to John and then a win against David, however, could possibly see yours truly collect the silverware if i manage a win against John in the last round. Good luck Rob. On Thursday, 9th September, there is the last round of the Majors at Wigston; both Grahams, Rajan, and Sean compete in the Open section; and Dave plays Dennis Wilkins in the Minor. There is soon to be a programme about chess on the wireless. Some interesting and amusing stuff. It is updated several times a week. The Harrod Cup match against Loughborough is fixed for Wednesday 15th September.